Petal Palette card Stampin up! Hello and welcome back to Chapter Crafts. Today I have made a very simple card using the Petal Palette bundle from the spring/ summer catalogue from Stampin up! This is one of those sets where you can use to make simple cards that take a few minutes to advance cards that take time, using any colour to change the card. First you need whisper white card stock cut to 8 1\4" x 5 13\16" and score @ 4 1\8"
Using the Petal passion designer series paper cut out 4" x 5 6\8". Stamp bird image in basic black and cut out, attach to card front. 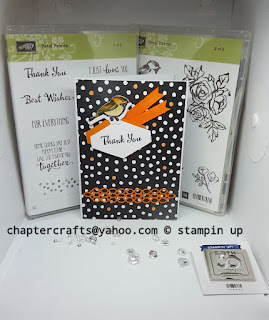 Using the tailored tag punch out 1 in whisper white & 1 in pumpkin pie stick together . Stamp sentiment on Whisper White. Using dimensional attach to the card front. Cut out lace detail and attach to card front. Labels: Petal palette thank you card.